Eleven-year-old Pea and her wonderfully wacky family are back for their second adventure in this fabulously funny series. 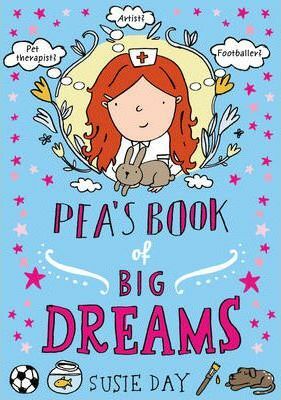 After securing herself a best friend and settling into London life, Pea is now contemplating her future and what exactly she should be when she grows up. Should she be a writer (like Mum)? An artist (like their crazy new au pair Klaudia)? A footballer? A pet therapist? Join Pea as she attempts to find out the answers - with hilarious results! Sorry if this is a cheeky question – but do you know what you want to be when you GROW UP? I’ve always wanted to be a writer like my mum. But my new teacher Mr Ellis only gave me 6 out of 50 on my English test, and I don’t think writers are allowed to get only 6 out of 50. "Girls who love a quirky family will enjoy Pea's Book of Best Friends by Susie Day . . . Sweet and funny."